The retail industry experiences a substantial turnover rate. According to a study performed by Hay Group, employee turnover in retail jumped 33 percent between 2011 and 2012. Those who work in this industry tend not to stay very long. According to the Houston Chronicle, turnover translates to time and money spent on interviews and new employee training. In addition, those who have to focus time and energy on training new staff members continually cannot focus on their jobs. This may lead to more unhappy employees or even customers who aren’t satisfied with the service provided by staff members. 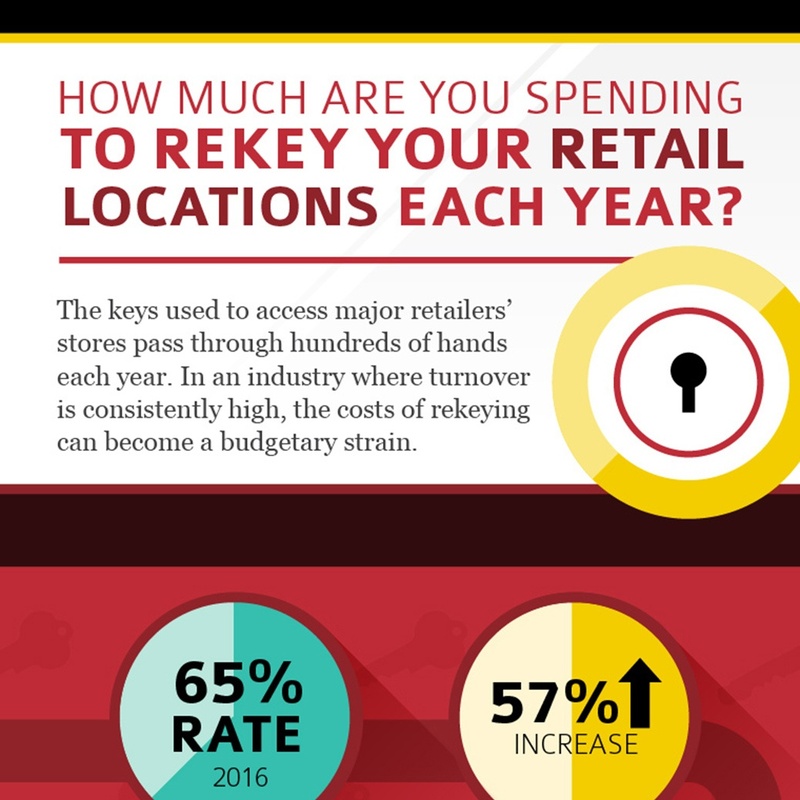 Another issue that arises because of the high turnover rate in the retail industry is the cost of replacing keys and locks. Managers provide keys to specific areas that allow employees to open the store and access inventory. However, when an individual leaves or is let go, he or she may still have their key. To ensure security, owners are then forced to call a locksmith, have the locks replaced and purchase new keys for their staff. Unfortunately, this can become a significant budgetary strain. To replace a front door lock and redistribute five new keys costs about $200. This is during normal business hours – emergency, late night situations or on holidays could cost even more. If a retailer has 1,000 locations nationwide and experiences the average 20 percent turnover rate, that business would need to rekey 200 front doors every year. This translates to $40,000 in expenses for the owner of a retail establishment. Fortunately, implementing a key control system can eliminate this substantial expense. Rekeying with InstaKey will only cost about $36 for a five key, one door system, so businesses wind up saving approximately $32,800 annually. With key control, a business owner is able to provide each employee with a serialized key that is essentially impossible to duplicate. This key can be customized to the needs of each individual employee. This system ensures an owner knows exactly how many keys are in circuit and who has access to what. If a key is lost, stolen or an employee no longer works for an operation, the owner of the establishment can take advantage of a rekeyable lock, which allows him or her to restore security quickly and conveniently. After the locks are rekeyed, old keys will be rendered useless.